In my mind I’m aware that an audio system is not flesh and blood. Yet in my heart I persist in thinking of my reference rig as a living, breathing thing that requires a certain amount of care and attention. Indeed, my reference system undergoes small adjustments, tweaks, and mods on a fairly consistent basis. But I’ve been remiss in reporting on them in these pages. Herewith are three components that have recently crossed the threshold of my listening room and have inexplicably slipped through the reviewing cracks until now: the Audience Au24 SX power cord, the Wireworld Starlight Ethernet cable, and Critical Mass Systems Sotto Voce equipment rack. By isolating my system from noise and vibration, they have improved the sound in many ways, particularly in revealing greater inner detail. AC power and vibration control are the foundations of an audio system. Though this metaphor may seem like a stretch, system building is not unlike a from-the-ground-up construction project. The trio of items I’ll cover here address: 1) system foundation by way of isolation and noise-floor reduction, 2) the overall structural framework of tone and timbre, and finally, 3) the details that flesh out the interior of the performance. These three components are system clarifiers—each making a unique contribution—and my setup has not been the same since they arrived. Having envied the handiwork of Critical Mass Systems ever since JV reported on the company, I was particularly taken by CMS’ more traditional equipment rack, the Sotto Voce. Its wood-frame design just seemed more appropriate to our home décor than some of CMS’ other rack materials and finish options. I mentioned this to Critical Mass’ maestro Joe Lavrencik, and soon after a well-traveled Sotto Voce demo sample in transit back from a trade show was diverted my way. 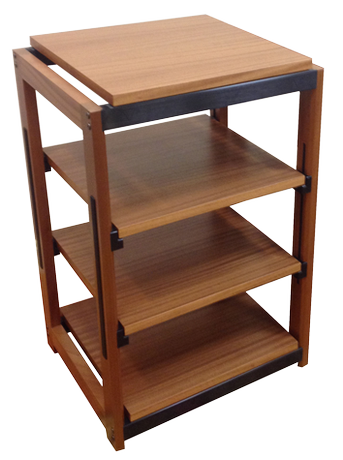 All CMS racks are upgradeable, and indeed this 38" SV four-shelf rack had been outfitted with optional shelves that the company enthusiastically describes as filters. The Sotto Voce arrived in several well-packaged boxes, and assembly was straightforward—if you’ve got the back for it. (These “filters” are darn heavy.) If you don’t, enlist a friend who has put in a little time at the gym. Once I had positioned and fired up my components—the Ypsilon Phaethon integrated, dCS Puccini CD player, Parasound JC3+ phonostage, and Sota Cosmos turntable/SME tonearm in the rack (bottom to top)—what I observed first was a clearer, weightier sense of the recording venue, with the permanence of brick and mortar. My listening room seemed to vanish, replaced by the presence and air of the concert hall. This wall-to-wall transformation is a key virtue of the Sotto Voce: an ability to drill down into the soundstage much deeper, mining larger amounts of ambient information. It defines the acoustic of a venue in much the same way your eyes might take in the dimensions of a concert hall or recording studio. The sonic improvements were not subtle or trivial—bass tightened, low-frequency notes were unearthed, and pitch ambiguity was resolved. Perhaps most significantly, low-level noise plummeted. It’s this last aspect, a stillness factor, that opens the soundstage, releases low-level orchestral cues, and is the key to the SV’s remarkable ability to elicit dimensionality from a recording. It anchors the system like no other component in my experience has. 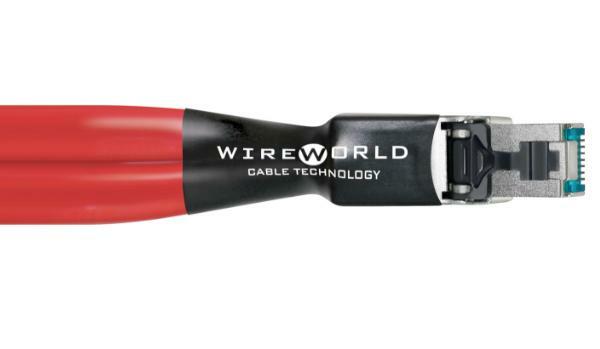 Wireworld’s Cat 8 Ethernet cable is designed to propel data at speeds of up to forty gigabits per second. Starlight is midway between the entry-level Chroma and top-rung Platinum in the company’s Cat 8 catalog, and currently fills a niche in my system that up until a few years ago didn’t even exist: the expanding world of computer-based media. I’m running a pair of these flat-profile, fire-engine-red data wires between an outboard 2TB Synology NAS drive, a Netgear router and my reference, the superb Lumin S1 media player (recently updated to accommodate MQA). Due to the flat grooved structure and flex of these parallel conductor cables (silver-clad/oxygen-free copper) I’m able to run greater lengths of these wires with ease. Wireworld maintains that its architecture also confers sonic advantages by virtue of the wire passing cleaner waveforms. Whereas the Audience cable (see below) and CMS rack (see above) addressed the foundational and structural aspects of my system’s performance, the Starlight Cat 8 addressed the more delicate garnishments and interior information within a recording. My biggest objection to early digital was its lack of spatiality, a flatness and constriction to the dimensional soundstage. Over time, new technologies and products have mitigated these digital flaws. Indeed, each time I listen to Wireworld products, there’s a lack of tension, a general ease. The Starlight reaffirms this warm and inviting characteristic. The cable satisfyingly conveyed the layers of the chorale voices during the Rutter Requiem by defining individual singers within each section and imparting the cavernous acoustic cues of the the Meyerson venue. Also noteworthy was the heightening of detail, be it between the strings of a guitar or mandolin, the rattles of a tambourine, the layering within a violin section, or the clear placement of the backing singers performing behind a lead vocalist. With Starlight, single-note lines or heavily orchestrated sections were reproduced with the clarity and focus of a Zeiss lens—no smear, no smudge. On piano, the Starlight sharpened transient attacks off the keyboard, and seemed to permit the soundboard to sustain and ring with harmonic energy just a little while longer. Did it leave any performance on the table? Well, there is the Wireworld Platinum. Finally there’s the Audience Au24 SX power cord dedicated for use with Audience’s own Adept Response conditioners, here, the six-outlet aR6-TSSOX. The SX cord has been upgraded significantly from the SE iteration with improved dielectric and a new grounding and isolation scheme. 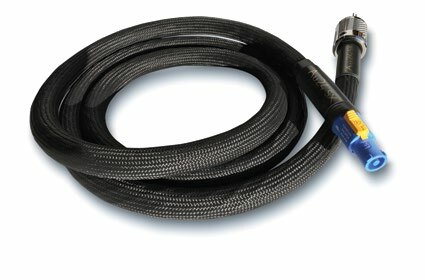 The Au24 SX uses a Neutrik connector at the conditioner end, and the superb Furutech FI-50 NCF (Nano Crystal Fiber) connector at the wall outlet. Greg Weaver has already written at length about the qualities of the Audience conditioner (an assessment that I am in complete agreement with). Was it possible to further improve the TSSOX’s already excellent performance with a pricey power cord swap? Fortunately or unfortunately depending on the state of your budget and the range and resolution of your system, it is. The sonic benefits realized with the SX differed from those experienced with Critical Mass Systems’ Sotto Voce equipment racks. The racks gave the system mass and made it feel deeply grounded, while the SX maintained a noise-free environment, like a “clean room” free of electronic detritus. Although the SX didn’t fundamentally shift the system in any one direction tonally, it created a more focused, direct, and polished performance at ever-lower levels. The silences and pauses within a recorded performance were captured as textural elements of the hall acoustics, instead of getting buried beneath electronic coloration. The softest pianissimo struck home with newfound clarity and color; drum fills bloomed with authority and pitch specificity. As I found with the CMS Sotto Voce, this musical performance was accompanied by greater ambient buoyancy, as if more oxygen had been pumped into the hall. The differences, though subtle, were compelling and musical. Like every improvement in the high end, once acquired, never relinquished. Stay tuned: I’ll have more to say about the Au24 SX power cords in a future review.